2014 JLS Premier Event: LIGHTS, CAMERA, ACTION! 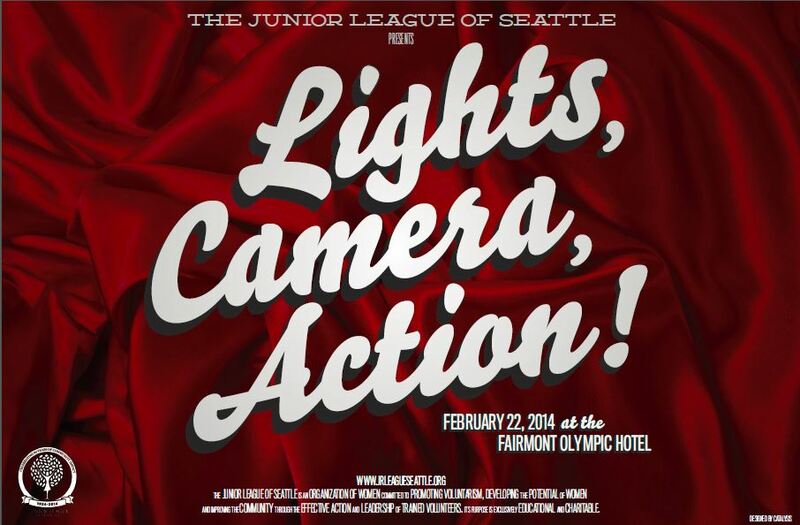 The Junior League of Seattle will soon be rolling out the red carpet and celebrating its 90th year in vintage Hollywood style with the Premier Event of Lights, Camera, Action! Be transported to the golden age of Hollywood for the League’s marquee fundraising and social event of the year as you enjoy delicious cocktails, wonderful food, silent and live auction items and plenty of fun with your friends and family! The event will be held on Saturday, February 22nd at the historic and luxurious Fairmont Olympic Hotel in downtown Seattle. Prepare to doll up in your favorite vintage Hollywood couture as you help the JLS reach the event fundraising goal of $165,000. Proceeds from Premier Event will enable the JLS to continue to support important community programs with partners such as Seattle Children’s Home, Seattle Public Schools, Treehouse, Boys and Girls Clubs of King County, Childhaven and many more. Buy your tickets by January 14th to take advantage of preferred pricing. The event is currently 80% sold out; we are well on our way to welcoming 390 attendees this year. Tickets are available on the JLS website. Classic tickets are $175 and include a three-course meal and accompanying wine fit for a vintage celebrity star, check-in/check-out and two hosted bars. VIP tickets are $250 (VIP tables are $2,500) and include elevated meal and wine pairings, dedicated VIP check-in/check-out, dedicated VIP hosted bar, overnight auction item storage and next day delivery (within a 15-mile radius of downtown Seattle), special event recognition and theme-inspired VIP accessories. The fun will continue into the night at the Premier Event After-Party where you can continue to rock your vintage look. The After-Party will directly follow the Premier Event and will also be held at Fairmont. Details and ticket information will be available soon. Special room rates with the Fairmont have been negotiated for the Premier Event. To take advantage of the below rates, call 1-800-821-8106 by January 22nd and mention you are with the Junior League when booking your reservation. You may also book your reservation online at https://resweb.passkey.com/go/juniorleague2014. The Premier Event committee is currently accepting donations for silent and live auction items. Do you have a vacation home? Have an abundance of airline miles? Know someone who owns a restaurant? Own season tickets to a local sports team or cultural event? Do you have connections for vacations, trips, and excursions? We like all of the above! Please contact Procurement Vice Chair Jenn Miller at jennmillerjls@live.com with connections you have for silent and live auction items. The Wall of Wine is a perennial Premier Event favorite and provides auction attendees an exciting way to build their wine cellar. You can contribute to the WOW at the January GM on the 21st and take advantage of a convenient way to make progress toward your annual fundraising credit obligation (1 credit will be given per $25 value) and a great way to share your favorite wine with an appreciative audience. We welcome WOW donations at a $25 value (desired brands include: Delille Cellars, L’Ecole, aMaurice Winery, Mark Ryan, JM Cellars, Alexandra Nicole Cellars) and at a $50 value (desired brands include: Nickel & Nickel, Cakebread, Leonetti, Cayuse Vineyards, Reynvaan, Quilceda Creek.) We also encourage you to bring your favorite wine (if not mentioned above) at the $25 and $50 price points. Please direct questions to Sarah Cooper. Be sure to follow the Premier Event on Facebook and Pinterest and Twitter to learn all about the latest exciting news for Premier Event. We look forward to seeing you on the red carpet! Bachelor Auction Preview – Check Out These Great Guys!